It was announced in Sydney this morning that SILVERCHAIR have been nominated for two ARIA Awards!! One is for BEST GROUP (which they won most recently at last years awards) and the other is for BEST MUSIC DVD along with touring buddies Powderfinger for the Across The Great Divide DVD. Silverchair hold ARIA Award history with the most awards ever - a staggering 19 over their career. The Awards will be held in Sydney on Sunday October 19 and telecast on the Ten Network. Silverchair's "Straight Lines" music video is available for online voting in the Best Rock category for MTV's Video Music Awards. This year MTV is letting fans vote online to determine which videos get nominated. Voting runs until Wednesday at 11am/EST. If you'd like to see "Straight Lines" make the final cut please vote now. We are pleased to report that the video for “If You Keep Losing Sleep” is eligible for the 2008 Inside Film Awards. Check out the clip online at www.ifawards.com and rate it now! The above documentary takes you inside the 2008 APRA Awards. Prior to scooping the pool at the Awards Silverchair’s Daniel Johns sat down with Chat Chat for an exclusive catch up! Don’t miss it tonight at 8.30pm on Music Max. Silverchair’s Daniel Johns and The Sleepy Jackson’s Luke Steele have been writing and recording songs together over the past few months. The long time friends and sometimes collaborators have no current plans for a release. Make sure you watch this space for further updates as they come to hand. Nominations for the 2008 APRA Music Awards were announced in Sydney earlier today with Silverchair’s Daniel Johns scoring nominations in both of the major categories. “Straight Lines” is up for the prestigious APRA Song of the Year Award and Most Played Australian Work. Past winners of the APRA Song of the Year award have included Missy Higgins for “Scar”, Neil and Tim Finn for “Four Seasons in One Day” and Kasey Chambers for “Not Pretty Enough”. It is Australia’s biggest peer-voted music award with 30,000 APRA members deciding the winner. While Daniel has written and co-written some classic Australian tunes none have ever been voted APRA Song of The Year. However, he has twice been named APRA Songwriter of the Year (in 1995 with bandmate Ben Gillies and in 2003 for his work on “Diorama”). The Songwriter of the Year Award is chosen by the APRA board. Nominees are not announced in advance for that category – a winner is simply announced on the night of the Awards ceremony. This most recent acknowledgement by APRA caps off another extraordinary year for Silverchair. After a lengthy hiatus the band returned in 2007 with their fifth consecutive number 1 charting album “Young Modern”. The disc was among the most acclaimed of the group’s career. It went on to be certified triple platinum and swept last year’s ARIA Awards. The 2008 APRA Music Awards will be held in Sydney on Monday June 16. U2’s the Edge has announced the Icons of Music Sale II to benefit Music Rising. This second annual auction event, hosted by Julien’s Auctions (www.juliensauctions.com) is to be held on Saturday, May 31, 2008 at Hard Rock Café New York in Times Square. It will offer one of the most significant collections of music memorabilia from many of music’s greatest legends with proceeds benefiting Music Rising (www.musicrising.org). Music Rising is a campaign co-founded by U2’s the Edge, legendary producer Bob Ezrin and Gibson Guitar Chairman and CEO Henry Juszkiewicz in 2005 to aid musicians of the Gulf Coast Region in regaining their livelihood after the devastation of Hurricanes Katrina and Rita. Silverchair has autographed and donated to the auction the guitar Daniel burned onstage in Newcastle at the final Across The Great Divide show. 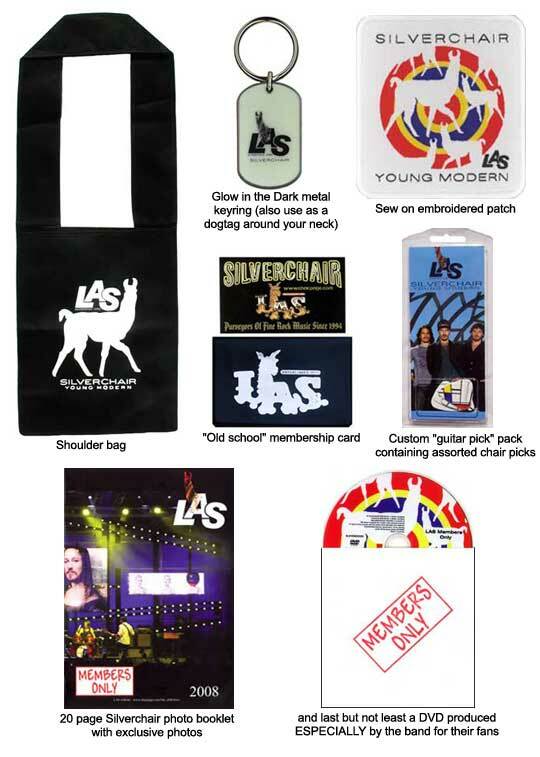 Love Silverchair but didn't think you had any reason to join the fan club (The LAS)? Of course the annual mail-out is in addition to all the other on-line benefits. ALL THIS FOR JUST $25 WITHIN AUSTRALIA AND $30 OUTSIDE AUSTRALIA. At the end of last year Silverchair stopped by to chat to the lovely folks at JBTV in Chicago. The podcast is now available for you to download for FREE! All you have to do is hit iTunes now and do a search for JBTV to check out all 24 minutes of the Silverchair podcast. You can even leave your comments there as well.